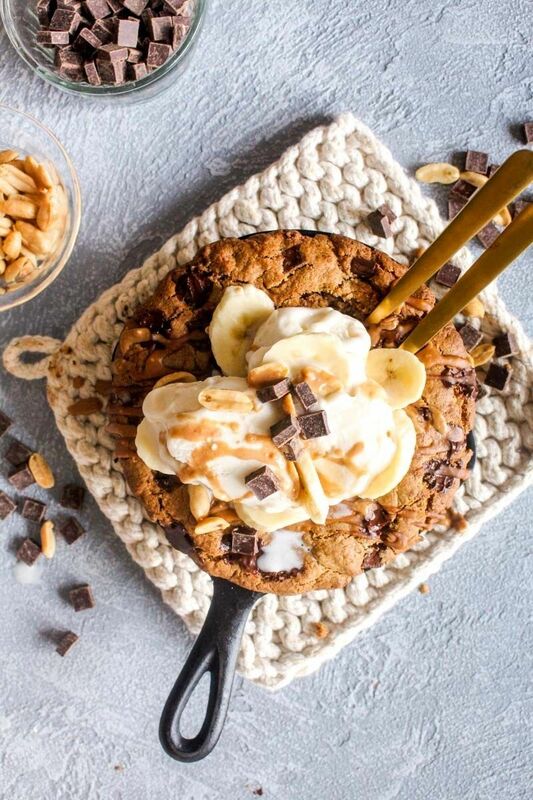 Protein Packed Chunky Monkey Cookie Skillet is baked til the edges are golden and the center warm cookie dough. Gluten free and made with whole grains! Add the coconut oil, peanut butter and coconut sugar to a small saucepan. Heat it over low heat, stirring occasionally, until the peanut butter and coconut oil are melted. Remove from the heat and add in the mashed banana and vanilla extract. Stir to combine. While the peanut butter mixture is melting, whisk the Kodiak Cakes mix, baking soda, and salt together in a medium bowl. Add in the peanut butter mixture and stir well to combine. Add in the chocolate chips, and stir again. Add the mixture into an 8 inch cast iron skillet, pressing the mixture down into the pan to form a level top. Bake for 25 minutes. Remove from the oven and let cool for 5 minutes. Top with ice cream, sliced banana, peanuts and extra chocolate chips, if desired. Serve immediately.